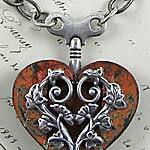 Beautiful necklace by Guest Designer Wendy Anderson. 22mm tall x 19mm wide. Information on materials and finishes: Antiqued silver-plate over cast pewter (or brass oxide or black oxide over cast pewter). All pewter is lead free and made in USA.